Wales centre Gavin Henson returned from a five-month injury lay-off to help his Ospreys side maintain their unbeaten Celtic League run with a 43-0 victory over Ulster. Henson came on in the 63rd minute for his first appearance since injuring an ankle against Saracens in the Anglo-Welsh Cup semi-final in April. But by the time Henson came on the Ospreys had the match in the bag with Tommy Bowe having scored the bonus-point try against his former side and in doing so equalling the Celtic League individual try-scoring record held by Matthew Watkins. The Ospreys could and should have had a bonus point in the bag by half-time but had to settle for a 19-0 interval lead. Despite being continuously penalised at the ruck area, the home side enjoyed a wealth of possession which they finished off with first-half tries from scrum-half Rhodri Wells, James Hook and Shane Williams, recently nominated for the IRB’s world player of the year award. Wells opened the scoring after nine minutes down the left having been put over by Williams after Lee Byrne collected an up-and-under. Full-back Byrne, in sparkling form, turned provider for Hook, who he put over under the posts for a converted try to give the Ospreys a 12-0 lead on 15 minutes. And it was Williams who completed the Ospreys’ first-half scoring when he breezed in down the right, taking advantage of Bryn Cunningham slipping over. Though Hook missed eight points in the first half, Ulster wing Clinton Schifoske was wayward with all three of his penalty attempts. 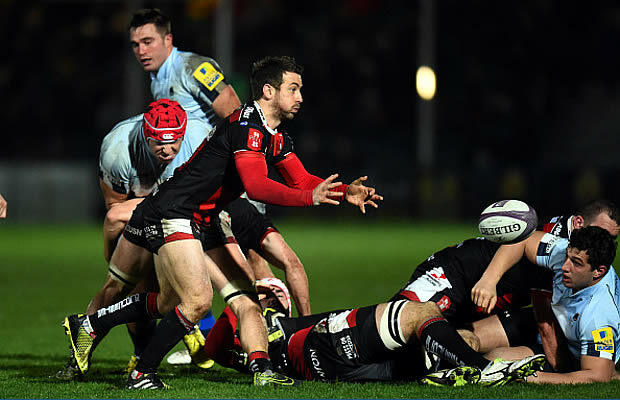 The match did not get much better for Ulster, who lost flanker Matt McCullough to the sin-bin for a professional foul. Hook kicked the resulting penalty. And seven minutes later Ospreys claimed the bonus point their performance deserved when Bowe latched onto Hook’s kick ahead. There was more bad news for Ulster. First the Ospreys put on four internationals from the replacements’ bench – Henson, Ryan Jones, Huw Bennett and Duncan Jones – before Brendon Botha was yellow-carded for a punch. Two minutes from time Byrne scored his side’s fifth try, going over from a scrum. Before the end Ulster’s evening was summed up when Stephen Ferris became his side’s third player to be yellow-carded. But the Ospreys had the final say with a try for Ryan Jones in the eighth minute of injury time, converted by Hook, who finished the match with 18 points.